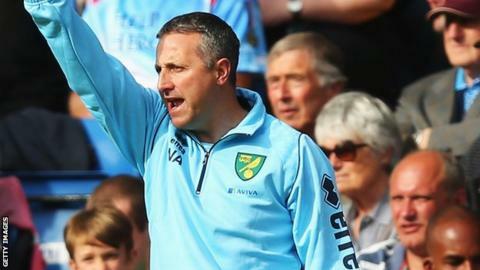 Norwich City manager Neil Adams has said he wants to be in charge of the all-but relegated side next season. Adams, 48, became boss until the end of the campaign after Chris Hughton was sacked last month and has taken one point from four Premier League games. Sunderland's midweek win over West Brom effectively relegated the Canaries. "Of course I'd love to be considered for it. People know I would love to do the job. It's now a case of wait and see," Adams told BBC Radio Norfolk. Norwich will be looking for their first win in seven games when they face Arsenal at Carrow Road on Sunday. The Canaries halted a five-game losing run with last week's 0-0 draw at Chelsea. Former Norwich midfielder Adams was promoted from youth-team coach five weeks ago to replace Hughton and was given five games to save the Canaries from the drop. He has suffered defeats by Fulham, Liverpool and Manchester United, but managed to secure a 0-0 draw at Chelsea last week. That point gave Norwich hope of surviving, but Sunderland's 2-0 win over Albion on Wednesday means the Canaries would have to beat Arsenal on Sunday, hope West Brom lose to Stoke City and make up 17 goals in the process. That means the Carrow Road side are preparing for life in the Championship, but it is unclear who will be the manager. Former Norwich striker Iwan Roberts has said ex-Cardiff boss Malky Mackay, who has agreed a settlement with the Bluebirds over his dismissal, would be a good candidate. But Adams, who is experiencing his first taste of senior management, believes he has done enough to be considered. "I think I've done a good job. There are parts of the job - team setup and getting a performance from the team - that are essentials and I'd like to think people think I've done those," he said. "It needs to be sorted, of course it does. "I, along with the media, am intrigued as to what's going to happen. Have I enjoyed it and felt like I've done a good job? Yes. "The experience can only be gained one way - by doing it. It's something everyone wants an answer to and I'm one of them."